I have two cards to share with you today! I'm slightly obsessed with the new Botanic Hello and have found that there is much you can do with this set! Here, I white embossed the image onto kraft cardstock then took a white colored pencil and gave the florals some shading. It really made the HELLO stand out and gave the florals a softer look. The next card is created by our resident crafter Cindy who kept making Benedict Cumberbatch references when she was looking at the Otterly Adorable set. We came across a couple of references on our social media accounts too when we first peeked Otterly Adorable. Apparently, there's something about a wildly popular show starring Benedict Cumberbatch (Sherlock) and that he resembles an otter?! I gave Cindy free liberty to pay homage to this reference and here is what she created! Cute, right? And the "did you miss me?" sentiment relates to the fact that the show only airs something like 3 episodes every few years?! Whaaaat?! On the inside she stamped the sentiment "because I've missed you." Such a great card in general, but especially for those who gets these Sherlock/Benedict Cumberbatch references! I am always excited to see your new releases. Botanic Hello is beautiful! Love the new stuff.. especially the dies! I love the show reference even though I don't watch! I love the idea of the door for all seasons too, and the black! Looking forward to your fabulous new releases! A great release! The otter card is fun, and the Hello stamp is so gorgeous on the kraft. Love the Sherlock card. I'm a huge fan of the original books, the Basil Rathbone movies and the TV series. I've also been to 221B Baker St in London. Must check out the door product. I love the botanic hello and the otter card is cute even if you don't get the Sherlock reference! Love all the ME releases! I follow on Instagram. Oh I can't wait!!! Loving everything so far and the otter stamp is the cutest I've seen so far!! I don't know the Sherlock reference, but I love the otters! They are one of my favorite animals ever!! I follow you on Twitter and tweeted about your release! So excited about this new release!!!! i am loving that botanic hello! Love the sets! Following you on all channels so that I don't miss any ME goodness! Beautiful 'hello' card and I love that door card with the cute otter too! I've got to have the "Just a Note" stamp. That's one I will wear out with use. This is a great release. Love the new alpha sets too! Fabulous and beautiful Hello stamp! Thanks for the inspirations! The otter card with the Sherlock reference is adorable! I adore the floral stamp set. I love every stamps from mama elephant. been sAVING my money for this release and the wait is here! so excited to see new sets and all the beautiful creations! What a cute interactive card! Love that door die. Love the Sherlock show too. Beautiful cards I am super excited for this release. Love the Sherlock Holmes card it's awesome. Ah, the door die is great! Adorable otter card! 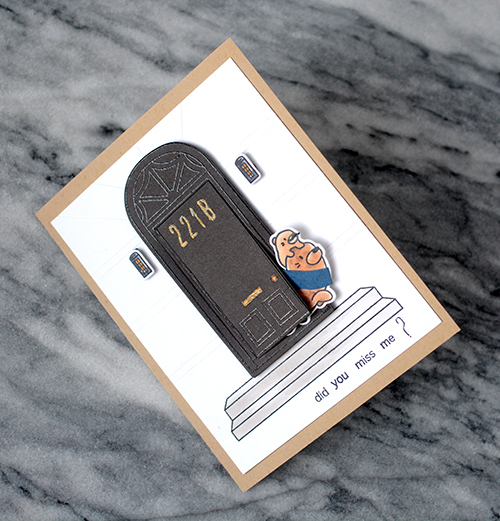 I'm not familiar with the Sherlock/Benedict Cumberbatch reference but still think the card looks stunning!! Oh adorable!! I LOVE all these fun new products. Great release!! Love white stamping on kraft! Looks so good to me so you know I love that Hello card! Just fantastic! I love the pop you added to your hello card w/ the shading. So gorgeous!! I will admit the Benedict Cumberbatch references went right over my head, but the otter is just too cute!!! Absolutely fabulous products, love the floral hello and all of your designers creations! I am already a follower on FB, twitter and instagram! The card with the otters coming out of the door is so cute. The zipper pull die is on the top of my Wishlist from this release. Just love the January release. My favorite has to be the Botanic Hello! Love the otters and especially the Sherlock reference (big fan here!)! I follow and have shared on Instagram. I am totally in love with your January release. I will be placing an order soon. Wonderful release and two lovely cards! The Botanic Hello set is so beautiful and versatile. Love Sherlock and love your Botanical Hello card. Wow! Just amazing projects and fun new products!! This is an amazing release! Can't wait to play with the otters 😍 Anx the botanical hello makes for such an elegant and versatile set. Thank you for these great products! Oh my goodness! The otter card is adorable! OMG!!!! The Sherlock card is one of the coolest I have ever seen<!!!! Love the new Botanic Hello! I just love this release. The botanical Hello is so beautiful. A fantastic release! I have GOT to have the Botanic Hello, its so beautiful! Really great cards as well. I like, follow and shared on fb about this release. I also fallow you guys on FB - love having Mama Elephant goodies pop up in my FB feed! I am also a follower on Insta! My fave place (besides the blog) to find ME inspiration! 1. Wow! Another amazing release!!! Love your cutie otters stamps!!! Really adorable!!! I am in LOVE with your stamps! I follow you on Instagram and FB, and I share your information with all of my crafty friends. Thanks for putting out such a great product! The HELLO stamp is so beautiful is doesn't need anything at all - making a quick and beautiful card so easy. I ordered right away. 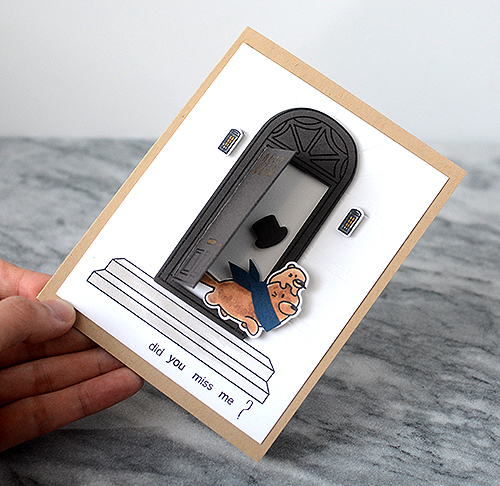 I thank you so much for using the door die in something other than a holiday card! It opened up a whole new world of ideas for me. I'd like to see "older" products used in more posts with new products. I ❤️❤️❤️ Cindys card!!! We are huge Sherlock fans, so this was an extra fun card to see!!! Very excited about this release, the little otters are so adorable!! I love both cards! Huge inspiration! Love it! Love the white on kraft Botanic Hello and the interactive feature of the second card. Another fantastic release! I love the otters and the big floral Hello! Very nice release! Love your products. Such sweet products, beautiful work too! The otter set is so cute! The botanical hello is so perfect for sets of cards! Love all the cute little critters, too! The botanic hello is amazing!!!! Love the Baker Street reference! I love that floral hello Kryssi. wOW. Such a cute second card with the opening door. So happy to see this release. Fabulous! Adorable cards -- I especially like the botanical hello. Absolutely love the Botanical Hello!! Love the adorable otters! Great cards and new release! Wonderful release and love the inspiration from the DT. I follow on FB, Instagram, and Twitter. Thanks for a chance to win. Well that Sherlock card is just brilliant!! And I love the otters! I love the way the hello stamp looks on kraft in the white...just stunning! Fantastic release. 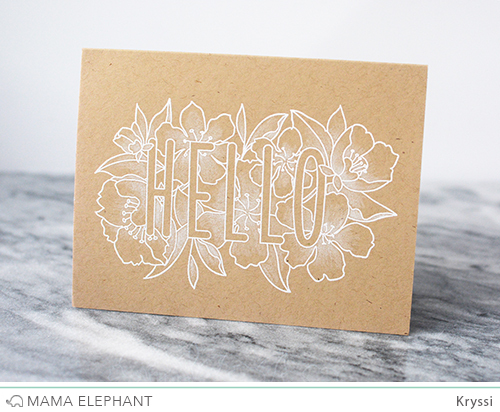 Love the botanic hello in white on kraft - very elegant. The otter is cute, but I'm not sure that I see the resemblance, lol. Wow!Fantastic release!I like them all but the dies are simply amazing!Especially the zipper one! I love the new stamps and the new zipper die. The designers have done a lovely job of showcasing the new release. That botanical hello is beautiful! Love the font of the hello!! Great release too! I follow on Twitter and retweeted (@acools). I shared on FB (Amy Maddux Cooley). Super adorable release I love the little otters and the letters are gorgeous. Great stamps as usual!! Mama Elephant is the best! Can't stand it... CUTEST CRITTERS EVER. ROFL! The Sherlock otter card is awesome! Love the cute otters! The white floral on kraft is really pretty. Love ME! I already follow on FB! I love the Botanic Hello and I saw it on a blog hop. It is so beautiful and I would love to win that stamp! I would really love to win that stamp! The card with the door that opens is so cute! I don't have a die cutter so I probably couldn't do that one but the otter is so cute coming out of the door! I love both cards! I have liked you on my mom's Facebook page. LOVE this release! So adorable! I am so in love with that door and steps! So many ways to use it with your cute kiddo stamps and dies! Sheesh, as if otters aren't already darn cute!! Love the fun door image and interactive card! Shared on Facebook. Love, love, love the new hello stamp! These cards are lovely! I love the new hello stamp. I love them all. Liked on FB, Followed on Twitter and Instagram! and Lovely DT inspiration, thanks! What a fun release! Loving the adorable otters! Such adorable release ! The Sherlock otter card is just brilliant !! Great release, as you have the best design team! Love these otters! great makes by the design team! These otters are sweet...and I too wish there were more new episodes of Sherlock as am a big fan. These are amazingly adorable. I <3 otters and would love to win. Not sure how to find the correct post on fb to comment. Love all the new sets!